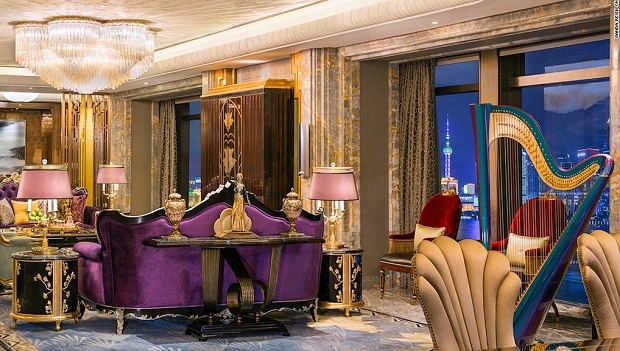 Billing itself a “seven-star” hotel — the first of its kind in Shanghai — the Wanda Reign on the Bund certainly makes the appropriate first impression. The exterior is an awe-inspiring mix of glass and steel. Upon entering the lobby, guests walk across Art Deco-inspired jade inlaid floors toward a wall-sized abstract painting of Shanghai by renowned Chinese contemporary artist Shi Qi. Large marble columns extend to a 10-meter-high ceiling. Opened in June after three years of construction, the $516 million hotel is the latest addition to the many high-end hospitality options along the iconic Bund waterfront of the Huangpu River, joining the likes of the Peninsula, Waldorf Astoria and, across the river, Shangri-La and Grand Hyatt. It’s the 51st hotel of the Wanda Hotels & Resorts group, part of the Dalian Wanda empire under the helm of China’s richest man, Wang Jianlin. And in less than six months, it has become the destination of choice for business travelers in China. To see inside this wonder, at CNN, click here.